The messianic grafted in symbol in a whole new design! 14K Gold set with total of 0.10 carat full cut Diamonds. 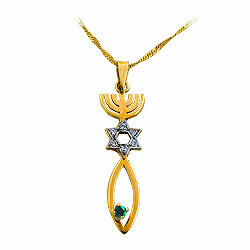 The pendant also features a single peridot stone (Green).